Miners have played an essential role in warfare since the First Great War. They collect raw minerals which can be processed at a refinery to generate revenue for the commander to fund his war effort. Heavily armored and immune to mind control due to them being remote controlled, miners are difficult to destroy with conventional forces. Thanks to SteinsTech's advancements in chrono technology, the Chrono Miner has been outfitted with a miniature teleporting device that will automatically teleport the miner to its refinery when its cargo bays are full or when the commander orders it to. This allows the miner to not only transport resources much faster than the Soviet and Epsilon counterparts, but also allows it to escape from encroaching enemies, including Soviet Terror Drones if the miner becomes infected. Unfortunately, the carrying capacity of the vehicle had to be reduced due to the large size of the chronodevice, effectively halving the amount of ore that can be carried. The Robot Tank was previously a Japanese commercial security robot. 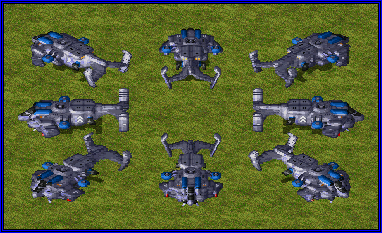 Programmed with powerful friend/foe recognition algorithms and hover engines for naval patrols, its main role was to defend vital Kanegawa Industries research and military compounds from intruders. 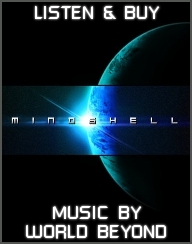 Once Epsilon arose and the threat of their mind control techniques become known, the Robot Tank was incorporated into all Allied arsenals and outfitted with a 'Jupiter' laser cannon to counter Epsilon Adepts and Elites. Robot Tanks are also excellent in preventing enemy infiltration of Allied bases as they can easily "see" past disguises. Driver cannot be killed. There is none, silly. Can detect disguised, cloaked and submerged units (sensors range: 7). This unit is unique to United States of America. The Stryker Infantry Fighting Vehicle is the newest development in multipurpose support vehicles. It comes equipped with standard light anti-armor missiles capable of accurately taking down enemy aircraft with great ease even while on the move. Its great speed, the highest among its peers, allows it to effectively perform hit and run tactics. The Stryker can be deployed through the 'Bloodhounds' support power as well. But the Stryker's greatest strength lies in its ability to adapt to almost any situation presented to an Allied commander. This vehicle houses a complex weapons system which allows any infantry that enters it to integrate their weapon into the turret of the Stryker. 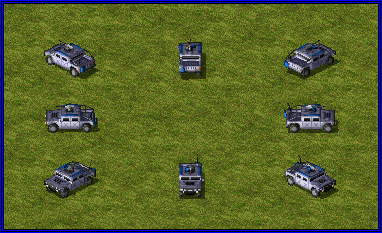 This allows the IFV to quickly be equipped to handle almost any problem efficiently. Since Tanya is the only Allied heroine that can enter an IFV, the Stryker will gain a powerful portable Mercury mode when she enters the vehicle. Can fire on the move (except for several modes). In order to counter heavy Soviet armor, a light tank concept was proposed with emphasis on the quick elimination of enemy vehicles. The concept of this tank was based on the older Light Tank design from the Second World War, along with some significant upgrades. Out of this concept, the Bulldog was born. Along with being one of the fastest tanks on the battlefield, the Bulldog simultaneously makes use of flashbang grenades in order to blind enemy infantry. The Bulldog's flashbang targeting is not as precise as that of the Riot Trooper's though, which makes it difficult for Bulldogs to clear enemy garrisons. Flashbang decreases firepower of targeted infantry by 10%. This unit is unique to European Alliance. 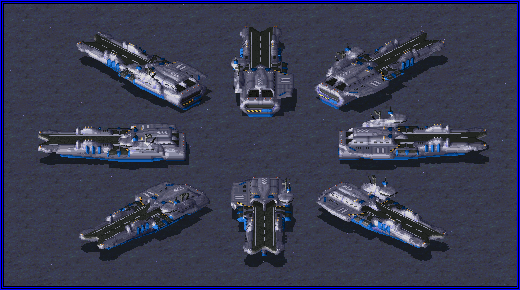 The Archon Armored Multirole Carrier is a derivative of the original Stryker model used by the United States, designed for more intense combat situations. 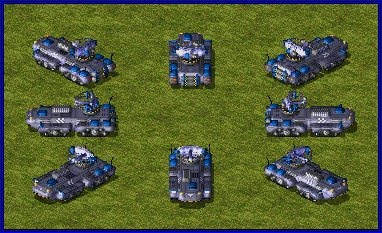 Now equipped with heavier armor, the Archon is the most durable of IFVs, making it a viable defense option. The additional weight however, does render it slower than its American cousin, making it less suitable for quick assaults. The Cavalier Medium Battle Tank is the continuation of the Medium Tank from the Second Great War. Although its main features have remained relatively unchanged, such as its 105mm cannon, the Cavalier is faster and better armored than its predecessor. The Cavalier is the bread and butter of every Euro Alliance armor column, effective at destroying enemy armor and structures. This tank also provides a middle ground between the powerful but slow Rhino Heavy Tank utilized by the Russians and the quick but lightly armored Lasher Light Tank used by PsiCorps. 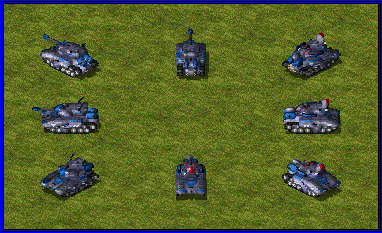 Unfortunately, due to the nature of the warhead used, the tank's effectiveness against infantry is mediocre at best. The most prominent improvement to the tank is the integrated firing enhancement system soldiers jokingly call the 'wind-up'. 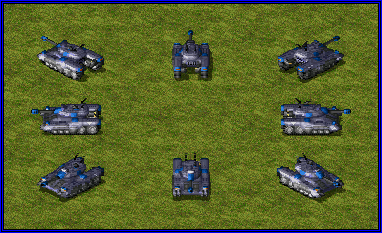 The system allows the tank to fire its shells at an increased rate after a short warm-up time, dealing more damage in less time as long as it remains locked on a target. A linear red light is visible whenever the 'wind-up' is fully operational. The longer it fires, the more powerful its attack gets. 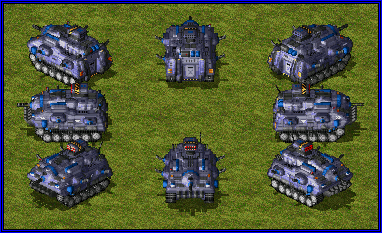 This unit is unique to Pacific Front. 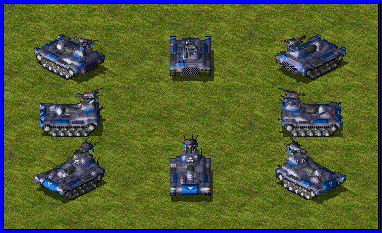 The Tsurugi is the Pacific Front equivalent of the IFVs used by the other Allied factions. This powersuit comes with several advantages. It has an increased passenger survivability rate and is completely impervious to environmental hazards such as radiation and toxins. Previously used in law enforcement, the Tsurugi was initially planned to be fully automated. However, when a Tsurugi's AI malfunctioned during a demonstration in Tokyo, killing a business man, the idea was scrapped in favor of a human pilot. The Kappa is a creature from Japanese folklore known to dwell in bodies of water, preying on humans and cattle. Like its mythical brethren, the Kappa Tank can traverse any body of water with ease, allowing it to attack unsuspecting enemies from almost any direction. Many Soviet and Epsilon bases have fallen victim to the Kappa's ability to overwhelm an enemy through a shore line assault. The Kappa takes a lot of engine power to keep it afloat and achieve speeds as high as the Robot Tank does, which comes with more difficulty due to this tank's larger weight and the fact that it is still a manned vehicle. However, due to the similar speeds, it makes a perfect companion to the Robot Tank. The Humvee is a light and agile vehicle capable of transporting infantry across the battlefield and is well suited for removing infantry threats with relative ease. While it used to be the premier anti-infantry vehicle for the United States before being replaced by the Robot Tank, it is now solely seen in combat as part of a ‘Bloodhounds’ airdrop. Deployed via Bloodhounds support power only in skirmish. 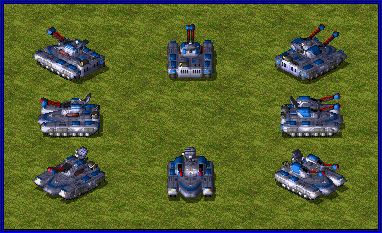 Available for all Allies instead of Robot Tank in Act One campaign. The Mobile Construction Vehicle, or MCV, is the most vital component in any military operation. The MCV is a massive vehicle with the ability to deploy into the Construction Yard, the heart of any base. 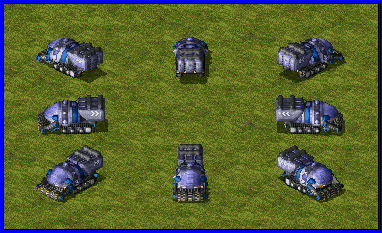 With it, a commander can create any military building they see fit. Protecting the MCV is a must if you wish to maintain any presence on the battlefield. Due to the technology and resources used in an MCV, the cost of building one is very high, but the expanding of your base using another MCV may prove more useful than you think. The Allied MCV provides all the necessary materials to build a base. When the Bolsheviks took control of Russia after the October Revolution, they began to persecute religious followers as a part of the Communist manifesto, which had as ideological objective the removal of all religion. This resulted in thousands of people fleeing Russia to the United States. One of them was Igor Sikorsky, who later set up the well known Sikorsky Aircraft Corporation. 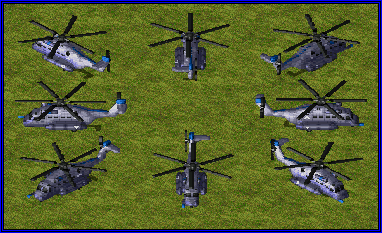 The Stallion Transport is one of Sikorsky's finest transport helicopters and a standard in all Allied armies. Its large passenger capacity, coupled with radar invisibility, allows it to easily insert infantry battalions behind enemy lines. Just be wary of anti-aircraft fire, as the helicopter can't take too much. Not affected by firepower or speed debuffers/buffers. If destroyed in flight, passengers might paradrop. 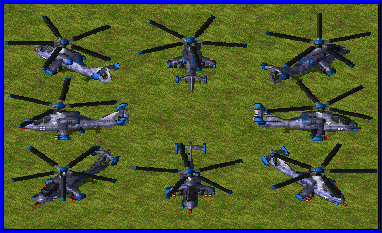 The Warhawk is a lightly armored helicopter used by the Americans for close air support. It's outfitted with a heavy laser cannon to light infantry ablaze and slice through tank armor, as well as another laser contraption, a small target painter similar to the one used by the Mercury Satellite, which it uses to mark enemy objects for others to prioritize on and deal more damage to. The Warhawk does not carry any anti-aircraft weaponry and relies on its quick speed to evade potential threats. Target painter temporarily reduces armor of any object by 20%. The Stormchild is an advanced fighter specifically equipped to efficiently deal with fast moving targets. With its high-tech lasers and powerful targeting systems, it's theoretically impossible for the fighter to miss its target. Its plentiful missiles benefit from the targeting systems as well, though they cause less damage individually than comparable warheads. Although the Stormchild is one of the fastest fighters in the Allied arsenal, it is rather fragile in the face of anti-aircraft fire. 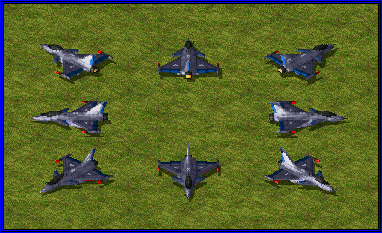 Due to a low radar cross-section, the fighter is invisible on radar, giving the Stormchild the element of surprise. 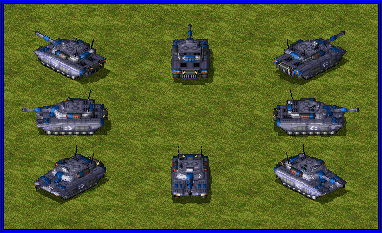 Mirage Tanks are some of the most advanced anti-armor units in the Euro Alliance arsenal. Developed in the SteinsTech laboratories in Germany, the tank has the unique ability to camouflage itself as a tree as long as the tank is stationary. In addition to being undetectable on radar, this allows the Mirage Tank to remain hidden in plain view. 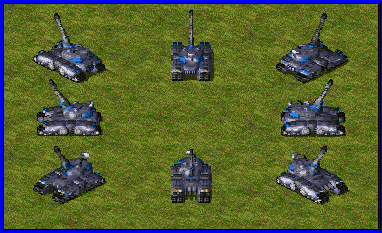 With its Kinetic Energy Penetrator Cannon, the tank is more than a match for enemy armor, especially during ambushes. The battlefield is a dangerous place, but when even the trees are gunning for you, you know there is nowhere you can hide. The Harrier is the primary fighter jet for the European forces and an effective tank buster. Built with mobility in mind, this jet makes use of modern Vertical Take-Off and Landing logic, allowing for runways to be considerably smaller and in turn allowing for the aircraft to be built and rearmed right on the battlefield. This lethal fighter is equipped with advanced High Explosive Anti-Tank missiles. When a missile hits an enemy, a large hole is blasted into the tank, exposing vulnerable systems for a short time. 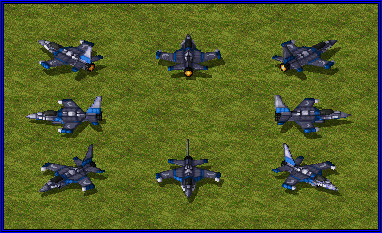 This allows the Harrier to either follow up with another missile for increased damage, or allow other forces to easily finish off the tank. Missile temporarily decreases target's armor by 40% for the next hit. The Zephyr Artillery is a self-propelled anti-tank artillery utilized by the Pacific Front to combat large armor columns from a safe distance. The Zephyrobot support power allows Zephyrs to target anything on the battlefield for a short while by shooting at the small stationary drone deployed on the battlefield through the use of this support power. Though a formidable foe at long range, the Zephyr is lightly armored in order to incorporate the needed targeting mechanisms. The minimum range of the weapon is another one of its weak points. Zephyrobot allows for a long range bombardment. 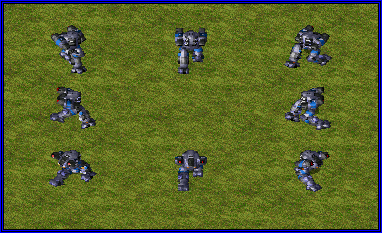 To use, place a Zephyrobot on the battlefield and order Zephyrs to fire at it. The Black Eagle's position as one of the best fighters in the world is uncontested to this day. It's good armor, great speed and advanced weaponry makes this dealer of death one of the biggest airborne threats to the Allied's enemies. 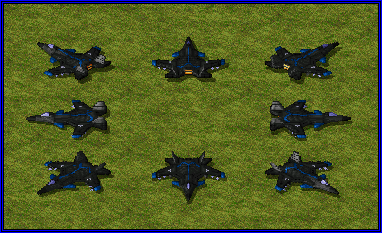 With its devastating cryo-missiles, the Black Eagle is capable of taking out many of enemy units in a single hit. The Black Eagle is a status symbol for the Pacific Front, a testament to their undeniable superiority when it comes to aerospace technology. One of the more interesting concepts to be fleshed out in the United States arsenal is the Athena Cannon. A large, but fragile vehicle that uses its communication devices to connect with the Mercury Satellite and give it information about the enemy location so that the weapon can adjust to the new coordinates and perform a powerful orbital laser strike. In comparison to the Mercury Strike controlled through the primary Uplink structure, the more precise coordinates set thanks to the use of mobile units in the field make the attacks requested by the Athena Cannon more focused and allow the satellite to deal more damage to enemy structures. However, the radius of such attack is smaller than the one the Allied commanders can order with the control building alone. 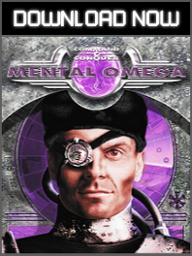 Nevertheless, while the power of an Athena-controlled Mercury attack is great, it might be tricky to use against moving objects due to the activation lag. The Athena Cannon's attack has a short pre-delay due to the need to recalibrate the satellite's location and angle, however if a Mercury Strike has previously been used in the vicinity of Athena Cannons' current position, their attack power will further be increased for a short while. Does not reveal its position when firing. The use of Mercury Strike near Athenas will increase their firepower by 25% for 16 seconds. The Abrams Tank has been the pride of the American armored division for several years now. With its thick armor, powerful 125mm cannon, and high-tech targeting systems, it really packs a punch. The Abrams has the ability to go toe-to-toe with even the mightiest of heavy tanks. 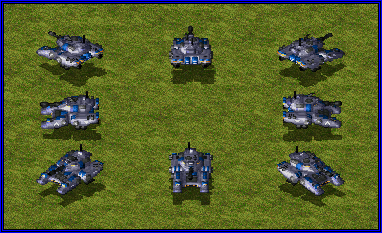 A competent commander can use the Abrams to easily out-range and out-maneuver his opponents. Due to advancements in laser technology, all Abrams models have been outfitted with dual 'Saturn' laser weapons, effective against almost all infantry threats but also useful against other sorts of targets. Of all the anti-aircraft systems, the Aeroblaze is probably the most feared and respected among pilots of all factions. Using incredibly powerful and accurate 'Quasar' laser cannons to reduce any and all aircraft to scrap metal, there is no aircraft that can out-maneuver the vehicle's weaponry once it has locked onto its target. This immense power comes at a price though, the Aeroblaze has to keep its guns trained skyward to keep the advanced tracking systems from malfunctioning, making it vulnerable to all other adversaries. 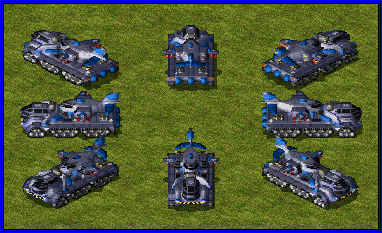 When it comes to artillery, the Prism Tank is the go-to for every European commander, bending light into a solid beam capable of inflicting great destructive force. Due to the hefty weight of the tank, the charge couplings usually built in Prism Towers were removed to allow for better mobility. 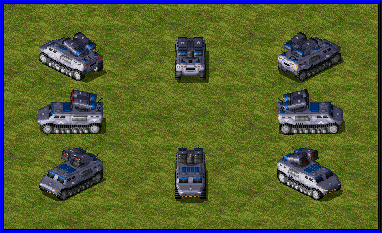 This makes the Prism Tank ineffective against armored vehicles. The tank's prism refractor is not only effective at destroying enemy structures, but can also function as an anti-infantry weapon in a pinch. The Charon Tank is the pinnacle of European technology. Its neutron cannon, a larger, more powerful version of the one used by Chrono Legionnaires, has the ability to instantly erase any unit targeted by it from this time and space. 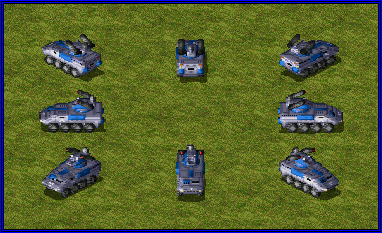 This allows the tank to immediately remove threats without any chance of retaliation. The sheer amount of energy used for this unstoppable weapon means that the Charon has a long cool down, making it vulnerable to enemies after it has fired. This weapon is not only technologically a fearsome weapon, but psychologically as well. Soldiers and tank pilots find the prospect of being flung into a completely different dimension a far more terrifying fate than mere death. The Charon's neutron cannon is still rather controversial, but due to lack of evidence to the true fate of this weapon's victims, the tank remains in European arsenals. The Thor is the most impressive unit in the European arsenal. 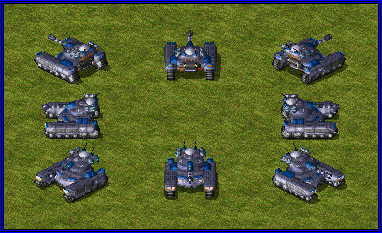 Created by a small, independent arms developer, the Thor has become the flagship of the European armed forces, often seen on the battlefield where the European Alliance sets its military might on full display. Its on-board miniaturized weather control device can create lightning bolts out of thin air, vaporizing infantry and heavily damaging aircraft within a radius while the craft's thick armor allows it to soak up plenty of damage. The gunship acts as a command unit in the field, as it is authorized to order personnel on the ground to divert to defensive tactics for a limited time. This makes the Thor a welcome sight to all Allied forces, the mere sight of it enough to instill awe in any soldier. Its firepower can be boosted by 20% using the Lightning Rod. "Hold position" doesn't work on chrono units, water-bound units or aircraft. 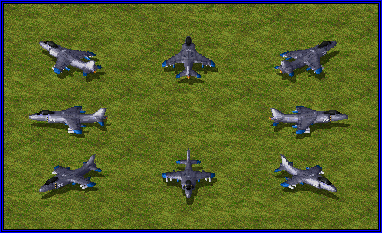 Use of "Hold position" makes Thor Gunship cease fire until the effect wears off. "Hold position" decreases speed by 50% while increasing armor by 40% for 30 seconds. Raining icy destruction from the skies above, the Hailstorm is the Pacific Front's premier siege engine. Formerly used to combat forest fires in Australia, the Hailstorm makes use of a bomber aircraft that unleashes several payloads of high-yield cryogenic substances, turning buildings into brittle constructs which easily collapse under their own weight. Though incredibly effective against structures and other hardened targets, the vehicle's Hailjet bomber is vulnerable to anti-aircraft fire. When the Pacific Front joined the Allies in light of the Soviet threat from China, the Japanese contributed an amazing piece of technology to the Allied arsenal. The Blizzard Tank was originally a non-lethal weapon, used to impede vehicles and immobilize unruly citizens or fleeing criminals with its unique Thermal Inversion cannon which could cool sub-atomic particles to temperatures which made movement almost impossible. Now this weapon's effectiveness has been amplified to such a level that any organic material is instantly destroyed and armored targets are slowed and their armor reduced to fragile layers of ice under the stress of the absolute zero temperatures inflicted by the Blizzard Tank. It is surprisingly effective against aircraft as well. Even though this weapon can out-range most conventional tanks and its effectiveness against infantry is undisputed, it only does negligible damage to structures. Weapon temporarily decreases ground target's speed by 50%. Another massive contribution made by the Pacific Front to the Allied cause came in the form of the Battle Tortoise. 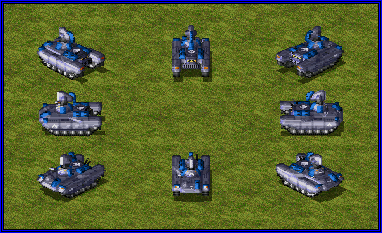 This moving citadel is capable of carrying several infantry units and allowing them to lead fire from its many operable gun ports along with its heavy machine gun to combat infantry and missile launcher against armored and airborne targets. 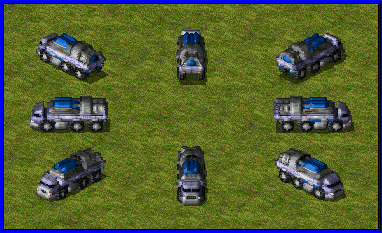 Due to the heavy layers of armor, the Battle Tortoise is not only capable of soaking up tons of damage, it can also simply crush smaller vehicles with its weight. Of course, the Tortoise has its drawbacks; the immense weight of the vehicle makes it quite cumbersome. 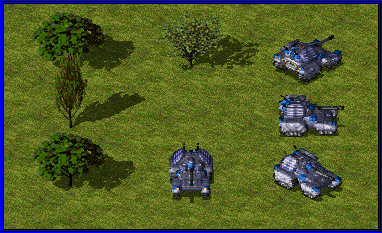 Combined with the cost of outfitting the Tortoise with infantry to provide extra firepower and the unit's susceptibility to mind control, the Battle Tortoise can prove to be very costly if destroyed or captured by the enemy. Infantry can fire from the Battle Tortoise. When an enemy installation is too well defended to be assaulted directly, the Barracuda steps in. Though not as quick as a regular jet, this bomber is a powerful tool for the precise removal of hardened targets and structures. Equipped with advanced stealth technology, the Barracuda is completely invisible on radar, swooping in and annihilating enemy buildings before the opponent can react. 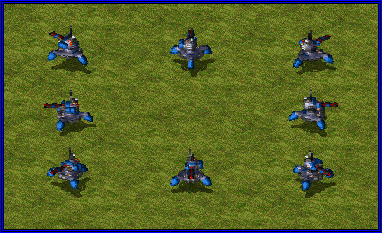 However, the paper thin armor and high cost of this unit make it something you don't want to be careless with. A project long delayed by the Kanegawa Industries, the Cryocopter is an unorthodox support aircraft capable of using a sophisticated cryobeam, which can draw out all heat in an object, turning it frozen-solid after a short while.The benefits of such effect on the battlefield are crystal clear: the object is put into a state of suspended animation, meaning it can no longer move or perform its actions as long as it is under a Cryocopter's influence. Additionally, the cryobeam makes the affected objects extremely fragile, making them very vulnerable to even the weakest of firearms. Even the largest of buildings or the most sturdy of tanks will be quickly shattered into pieces if fired at when the Cryocopter is doing its fine work. 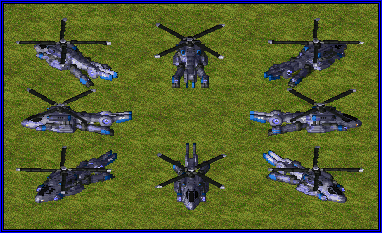 Be wary, as the Cryocopters has no other weapons of its own to fend of enemy units, especially if outnumbered. The weapon slowly freezes enemy objects, making them unable to work, move or fire. When frozen, durability of the affected object drops harshly, making it more vulnerable. The Hummingbird is a different approach to how enemy units can be toyed with and devaluated on the battlefield during combat. Coming from the SteinsTech labs, the Hummingbird is a result of another joint project developed by the European scientists; the fastest jet the Allied air force ever had, capable of forcing its enemies into a time warp where they move and fire much slower than usual. Unlike the Cryocopter, the Hummingbird's weapon has instant effects and works on a small area instead of a single target, however the jet is incapable of doing anything to enemy structures. Hummingbird's weapon halves enemy speed and firepower for 28 seconds. The ability to transport large amounts of forces over one of the most common environmental obstacles, water, has always been a deciding factor in war. Bodies of water of any size no longer prove to be a problem when amphibious transports are used. 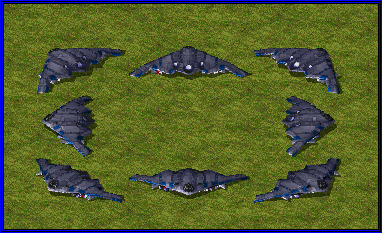 Easily gliding over water with their powerful turbines, they can transport both infantry and armor to any location. Keep in mind though that these transports are only lightly armed, and should not be put in harm's way in order to prevent severe losses. The Allied Voyager Transport is equipped with dual missile launchers, allowing it to defend itself from harassment from both ground and air forces. 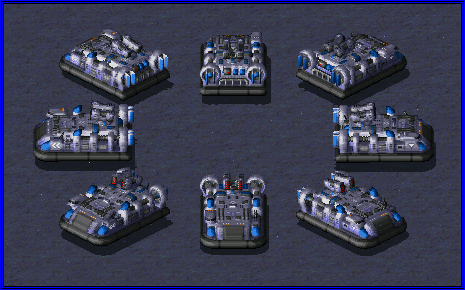 In Islands Voyager can be built from Allied War Factory. The Destroyer is the workhorse of the Allied Navy, capable of engaging enemy ships and shore installations with its powerful 155mm cannon. What makes the Destroyer unique though, is the V-22 Osprey mounted on its back, equipped with depth charges. This, in combination with the advanced sonar systems equipped with the ship, makes the Destroyer a versatile submarine hunter as well, especially when assisted by Navy SEALs. 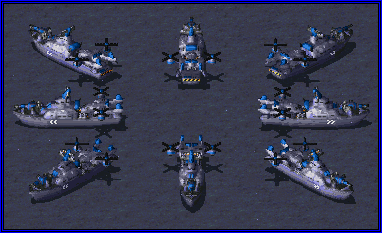 When micro-managed properly, it can use the cannon and the Osprey at once. Osprey - Speed: 20 (jet), Hitpoints: 200, Armor Class: Light Aircraft. Where most anti-air systems would falter, the Aegis Cruiser steps in. Equipped with multiple missile batteries capable of firing heat seeking missiles with deadly accuracy, the Aegis is the Allies' most powerful anti-air unit at sea. 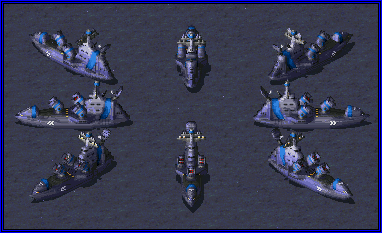 This does come with a drawback though, as the Aegis is completely defenseless against everything else. One of the initially controversional, and then most successful ideas was an attempt of training Dolphins for usage in the Allied navy. Those nimble mammals were capable of swiftly scouting nearby areas, and if any threat was found, a system of sensors would immediately send enemy coordinates to nearby units. With their assistance, Destroyers could intercept Soviet submarines from much larger distance. The roles have been reversed and the hunters became the hunted. 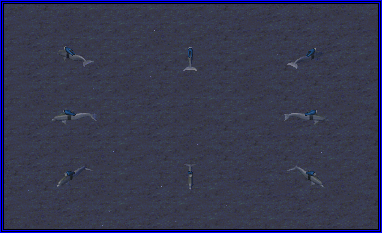 To amplify potential of Dolphins they have been equipped with another type of Comet Prism weapons which are mounted on their backs. 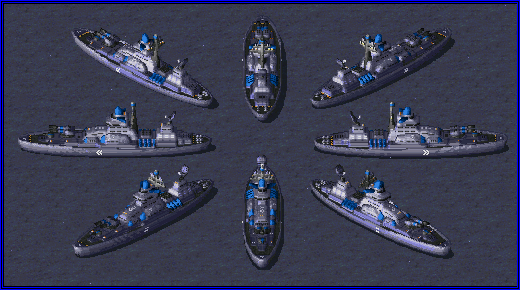 With those, they could attempt to engage not only enemies on waters, but also take down some targets at the shores. Right now, Dolphins remain in the Allied army as main scout and detection force, but when amassed, they become a force to be reckoned with. Cannot be hijacked, it's an animal. Driver cannot be killed, it's an animal. The Aircraft Carrier is one of the most powerful ships the Allies have to offer. Packing several UAVs capable of delivering their payload over huge distances with deadly accuracy, this floating airbase is capable of leveling any enemy base to the ground with ease. Just be careful, as the Carrier has a large minimum range, and thus is vulnerable to naval assault. Battleships are a product of the old doctrine that existed in the United Kingdom for nearly a century, called the 'two-power standard' - the Royal Navy had to be stronger than other two the strongest naval fleets combined on Earth. With their cooperation with the French, in a potential conflict the British had to secure the Atlantic, North Sea and the English Channel, while the French had to secure the Mediterranean Sea. Even after the First Great War, the British and the French were still expanding their naval fleets to the gigantic size with multiple Battleships that were ready just before the Second Great War. Relatively, the number of Battleships was so big, that these sometimes even 40 years old vessels were still present during the final stages of the Second Great War. After the Soviets were defeated for the first time, the number of them was so large that it was better to modernize them than to scrap and go only with the Aircraft Carriers like the Americans initially did. The cannons were replaced with bigger calibre together with other equipment like radars and advanced electronics, sometimes even 60 years old vessels are still useful during the conflict. When the Soviets moved into Europe and the United States again, the Battleships were used to defend the British Isles from the Soviet invasion in tandem with the Gladius Network, keeping them safe for many more months. They gave the Allies a significant advantage over their enemies and proved the everlasting strength of the Allied navy.